There are more than 200 Internationally recognised breeds of pedigreed dog. originally developed those individual breeds. The Labrador Retriever breed standard was developed in the early 1900's. That very same standard still exists today. It is the "blueprint" which guides us when determining the value of a particular dog. Conformation judges study it as a guide to assessing Labradors in the show ring. Breeders use it to ensure that their breeding programmes remain "on track". New owners should always refer to it when considering the purchase of a new puppy. "A Labrador Should Look Like A Labrador And Nothing Else". In Australia we have adopted the original Kennel Club of England breed standard. In 2008 a Breed Standard Extension was written by Mrs Pat Dunstan (Strangways). and was subsequently endorsed by the ANKC. The Breed Extension now forms part of the "official" breed standard. contained within the Breed Standard. We invite you to visit this very useful Coat Colour Inheritance Calculator. Permission has been granted by "Blue Knight" Labradors USA to link to this useful interactive tool. It explains in simple terms the mode of inheritance of Yellow, Black and Chocolate Coat Colour. And it allows the user to confidently predict the outcome of future planned matings. Please read an alert issued by the National Labrador Retriever Breed Council (Australia). It deals with the emergence of so-called Silver Coat Labradors. 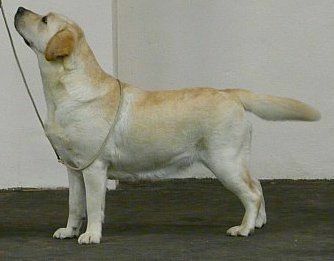 A Labrador Retriever with a Silver Coat is a cross bred. It indicates a combination between a Labrador and a Weimaraner.